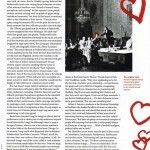 This article by Robert Loerzel originally appeared in Listen magazine’s summer 2011 issue. The concert hall was packed with thousands of young women. As they heard the music rising from the stage, they seemed to sigh in unison. Some of their faces turned pale. Some blushed, as if overcome with emotion. Their mouths twitched and their eyes sparkled. They swayed back and forth. Some of them sobbed. They called out at the musician commanding their attention, a young man with a floppy mop of curly blond hair. “Divine!” they exclaimed. “Adorable!” And as the concert ended, they leapt to their feet, applauding and shouting hysterically, demanding one encore after another. It was the 1890s, and the object of all this adoration was the virtuoso Polish pianist-composer Ignacy Jan Paderewski. This was decades before pop stars like the Beatles, Elvis Presley and Frank Sinatra whipped audiences into a similar frenzy. It was more than a century before teen and pre-teen audiences went wild for far less innovative or talented performers like Justin Bieber and Miley Cyrus. 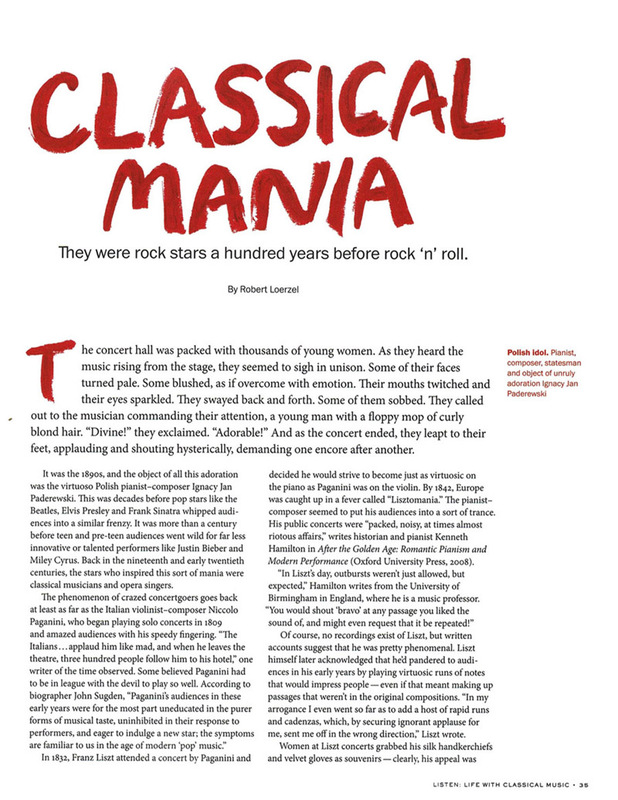 Back in the nineteenth and early twentieth centuries, the stars who inspired this sort of mania were classical musicians and opera singers. In 1832, Franz Liszt attended a concert by Paganini and decided he would strive to become just as virtuosic on the piano as Paganini was on the violin. By 1842, Europe was caught up in a fever called “Lisztomania.” The pianist-composer seemed to put his audiences into a sort of trance. 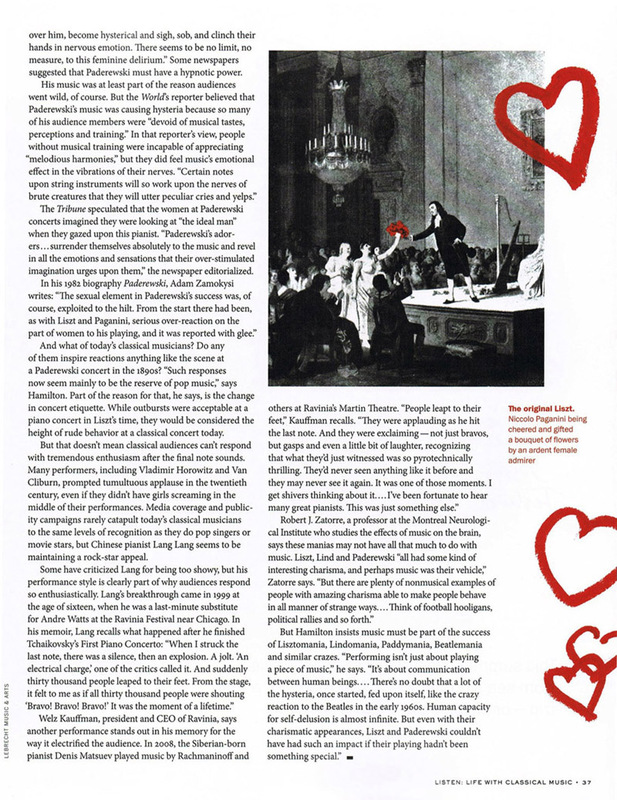 His public concerts were “packed, noisy, at times almost riotous affairs,” writes historian and pianist Kenneth Hamilton in After the Golden Age: Romantic Pianism and Modern Performance (Oxford University Press, 2008). “In Liszt’s day, outbursts weren’t just allowed, but expected,” Hamilton writes from the University of Birmingham in England, where he is a music professor. “You would shout ‘bravo’ at any passage you liked the sound of, and might even request that it be repeated!” Of course, no recordings exist of Liszt, but written accounts suggest that he was pretty phenomenal. Liszt himself later acknowledged that he’d pandered to audiences in his early years by playing virtuosic runs of notes that would impress people — even if that meant making up passages that weren’t in the original compositions. “In my arrogance I even went so far as to add a host of rapid runs and cadenzas, which, by securing ignorant applause for me, sent me off in the wrong direction,” Liszt wrote. The legendary showman P.T. 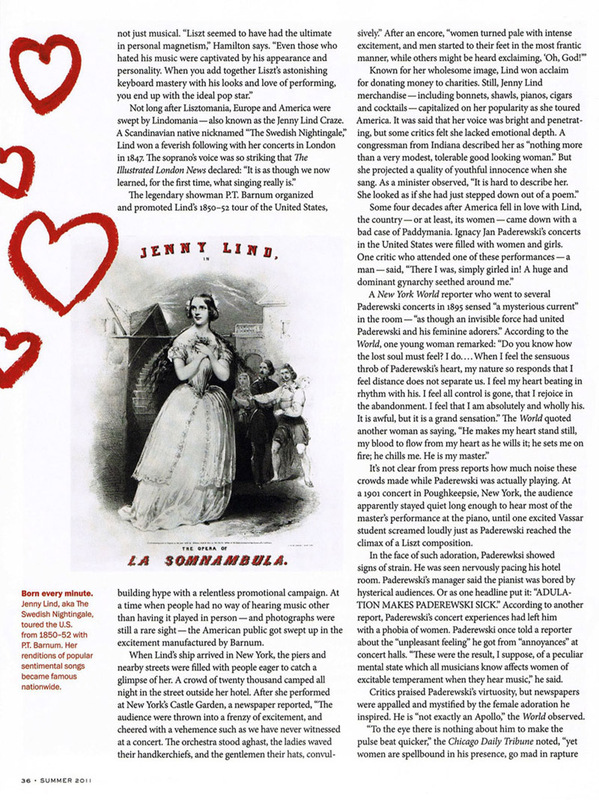 Barnum organized and promoted Lind’s 1850-52 tour of the United States, building hype with a relentless promotional campaign. At a time when people had no way of hearing music other than having it played in person — and photographs were still a rare sight — the American public got swept up in the excitement manufactured by Barnum. It’s not clear from press reports how much noise these crowds made while Paderewski was actually playing. At a 1901 concert in Poughkeepsie, New York, the audience apparently stayed quiet long enough to hear most of the master’s performance at the piano, until one excited Vassar student screamed loudly just as Paderewski reached the climax of a Liszt composition. In the face of such adoration, Paderewksi showed signs of strain. He was seen nervously pacing his hotel room. Paderewski’s manager said the pianist was bored by hysterical audiences. 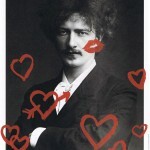 Or as one headline put it: “ADULATION MAKES PADEREWSKI SICK.” According to another report, Paderewski’s concert experiences had left him with a phobia of women. Paderewski once told a reporter about the “unpleasant feeling” he got from “annoyances” at concert halls. 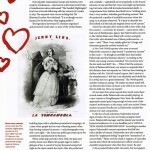 “These were the result, I suppose, of a peculiar mental state which all musicians know affects women of excitable temperament when they hear music,” he said. 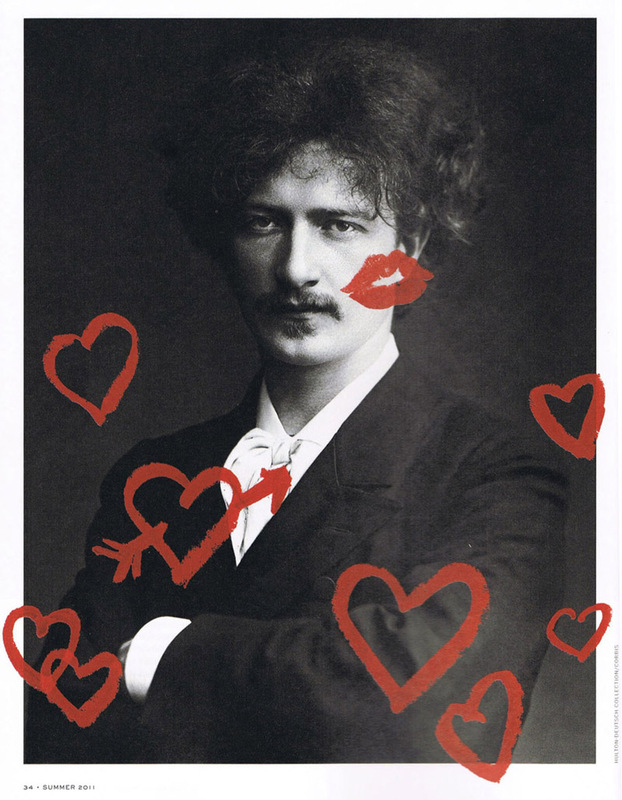 Critics praised Paderewski’s virtuosity, but newspapers were appalled and mystified by the female adoration he inspired. He is “not exactly an Apollo,” the World observed. “To the eye there is nothing about him to make the pulse beat quicker,” the Chicago Daily Tribune noted, “yet women are spellbound in his presence, go mad in rapture over him, become hysterical and sigh, sob, and clinch their hands in nervous emotion. There seems to be no limit, no measure, to this feminine delirium.” Some newspapers suggested that Paderewski must have a hypnotic power. The Tribune speculated that the women at Paderewski concerts imagined they were looking at “the ideal man” when they gazed upon this pianist. “Paderewski’s adorers … surrender themselves absolutely to the music and revel in all the emotions and sensations that their over-stimulated imagination urges upon them,” the newspaper editorialized. 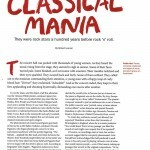 And what of today’s classical musicians? Do any of them inspire reactions anything like the scenes at a Paderewski concert in the 1890s? “Such responses now seem mainly to be the reserve of pop music,” says Hamilton. Part of the reason for that, he says, is the change in concert etiquette. While outbursts were acceptable at a piano concert in Liszt’s time, they would be considered the height of rude behavior at a classical concert today. But that doesn’t mean classical audiences can’t respond with tremendous enthusiasm after the final note sounds. Many performers, including Vladimir Horowitz and Van Cliburn, prompted tumultuous applause in the twentieth century, even if they didn’t have girls screaming in the middle of their performances. Media coverage and publicity campaigns rarely catapult today’s classical musicians to the same levels of recognition as they do pop singers or movie stars, but Chinese pianist Lang Lang seems to be maintaining a rock-star appeal.